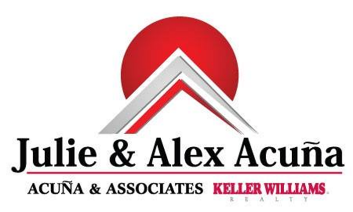 If you are viewing this newsletter through a link from Twitter or Facebook, please know that there may be important links included in the email that was sent. To view those documents, you will need to access the original email. Thanks! 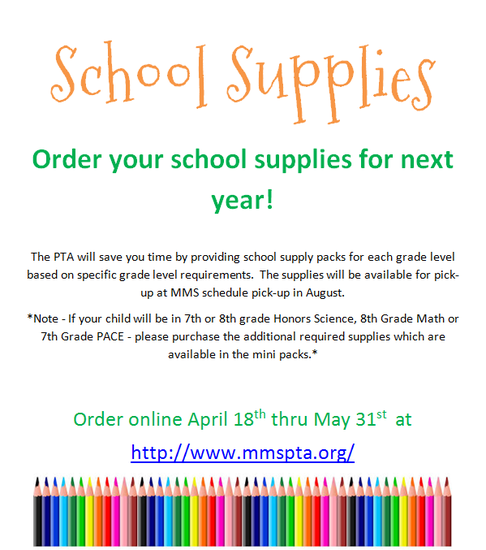 Order your school supplies HERE! May 16-26, Student Council and the History Department along with some help from the Honor’s societies are sponsoring a fundraising drive for veterans in observance of Memorial Day. 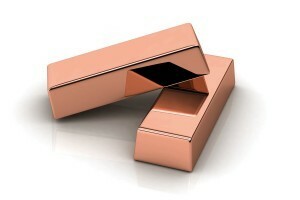 The charity organization is the GI GO Fund (http://www.gigofund.org/aboutus.html). We will raise funds through the history classes and each history teacher will compete for their students to win free Domino’s pizza and water for lunch on May 31. 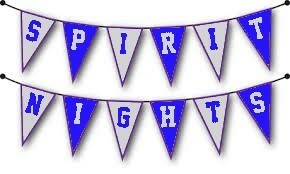 If we reach our goal of $1000 as a school the students will earn the ability to wear school appropriate PJ’s on May 31. To complement the drive we will have the students create a modern version of “Flander’s Field.” On May 20th the students will go out by grade level to place their paper poppies and create the field of poppies described in the famous poem. Also on May 20th we will invite military veterans to speak to students in their history class about their experiences to help put a face on the cause. As we near the end of the year, please remember that parents are NOT ALLOWED to bring lunches for students other than their own. As this is a statewide policy and a safety issue, please understand that we will not allow students to eat lunches provided by anyone except for someone on their emergency contact card. CLICK HERE TO VIEW THE FINAL EXAM SCHEDULE! Please note that all accounts must be paid in full by June 3rd. Any withdraws or transfers you would like to make need to be completed by June 2nd. 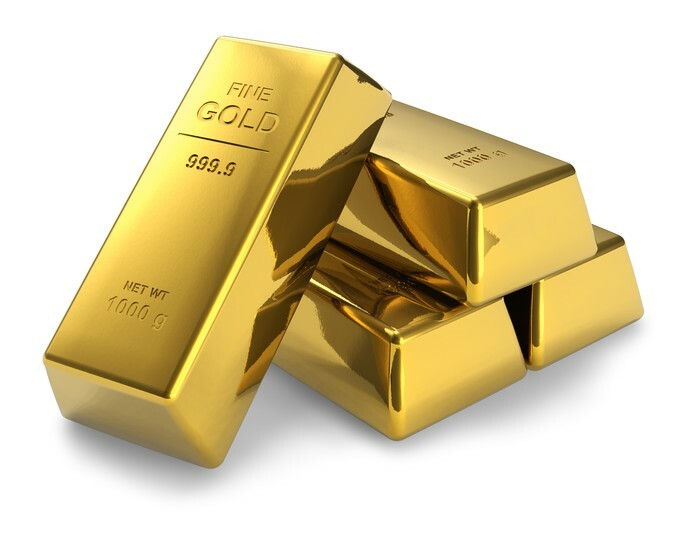 Any money left in your child's account will roll over to the following year, and will follow them to any school in PISD! To read the full letter, please open the documents below! *Please note: since our last eNews, the Spanish letter has been corrected. The new document is listed below! This is the “End of the Year” information from the school nurse. All Medications must be picked up by parents before the last day of school. Medication is not kept for the next school year. Students needing immunizations prior to 7th grade should have brought home information regarding this in April. To avoid a possible delay in August schedule release, please submit the proper paperwork prior to the end of the school year. Schedules will not be released until this has been done. You may email records to the school nurse at Joan.Boswell@pisd.edu or sent via FAX to: 469-752-7001 OR 469-752-7019. 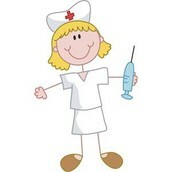 It has been a pleasure to provide healthcare to your child this school year. I hope your summer is safe and healthy. It's time to celebrate our awesome 8th grade class as they prepare to move on to HIGH SCHOOL! From 12pm-3pm on May 26th, our 8th graders will get to head over to Murphy PSA for food and fun to celebrate their time here at Murphy! Congratulations to those who competed in the Vase Art Competition! This past Saturday a select group of art students participated in the Regional Junior Vase Art Competition which took place at Otto Middle School. We are pleased to announce that all 17 students participating in 3 different divisions made it to the final round thus each received a medal!!! We also had two finalists, one in Division 1 which was Chloe Quin, and one in Division 2 which was Chloe Chan. They both received the highest medal which was the silver medal!!!! Ms. Anetopoulos would like to thank and congratulate all the students who participated they did an awesome job and both she and Mr. Sims are really proud of them!!! They rocked!!! Congrats to our Mock Trial Team! 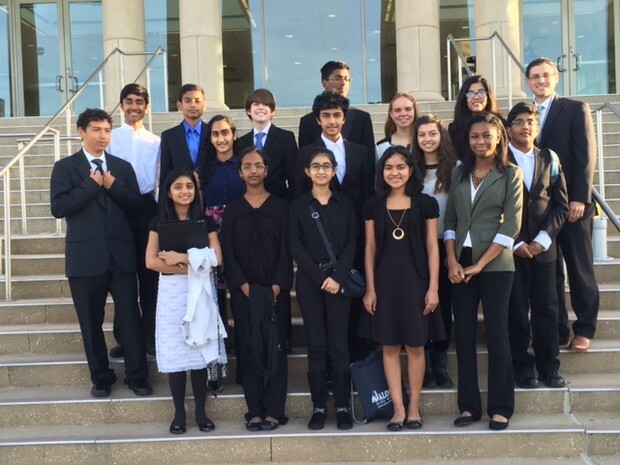 On May 6th, sixteen 8th graders competed in the 2016 Collin County Mock Trial Competition sponsored by the Collin County Bar Association. The annual event is held at the Collin County Courthouse in McKinney and is represented by teams from across the region. 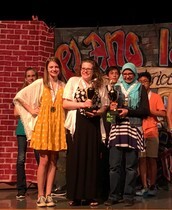 Anesa Abrahma was honored with a Best Attorney award and Nitya Lohia received Best Attorney in two out of the three rounds she participated in. Kamilah Ashley, Raishma Kazi, and Srihari Manoj each received a Best Witness award. Nitya Lohia and Saisrinivas Gudivada served as attorneys on a team that consisted of Sofia Al-Hennawi, Kamilah Ashley, Sreeja Eadha, Emily Glowski, Raishma Kazi, and Hanaa Siddiqui. 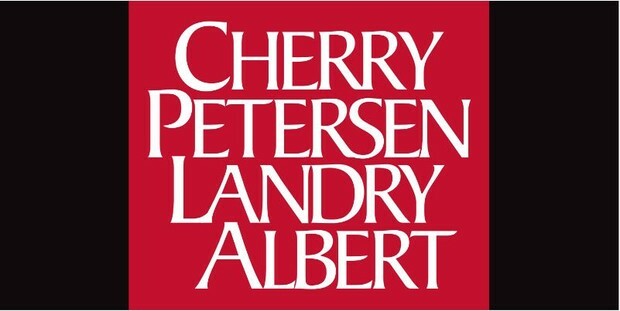 Anesa Abraham and Athulya Nagarajan served as attorneys on a team made up of Arun Eswara, Navya Kilaru, Michael Kuppinger, Brady Ligon, Srihari Manoj, and Hari Namdhari. What an awesome job both teams did! Please congratulate them for all their hard work and effort! Last Saturday was our last Speech/Debate tournament at Vines High School. Murphy did AMAZING and took home the most trophies! Although we lost to Rice in Sweepstakes, we beat our rival, Schimelpfenig, and took home the 2nd place trophy!! Mrs. Norris is BEYOND amazed by the hard work our students give and the time they put into these tournaments. Nevin Gera (7th grade) was the TOP scorer of the ENTIRE TOURNAMENT, giving our team 96 points ALL. ON. HIS. OWN! Which is unheard of. He and his partner, Umangi Singh, won 1st place in debate. These 2 work so hard and are such wonderful teammates, helping all the other teams with their debates. Nevin also went on to win 1st place in Original Oratory, Musical Pantomime, and placed 3rd in Extemporaneous Speaking. Cassie Pierce was the 2nd top scorer of the entire tournament, making it to finals in all her events! Here is the list of all of the other award-winning Speech and Debate Members! Olivia Allred, Abby Atterbury, Evie Atwell, Cassie Pierce, Hannah Rhodes, and Isabella Escobedo made it to finals in Lip Sync. Be sure to congratulate all of these amazing kids! Be sure to congratulate our Poetry Slam competitors! On May 3rd, the District Poetry Slam was held at Bowman Middle School. 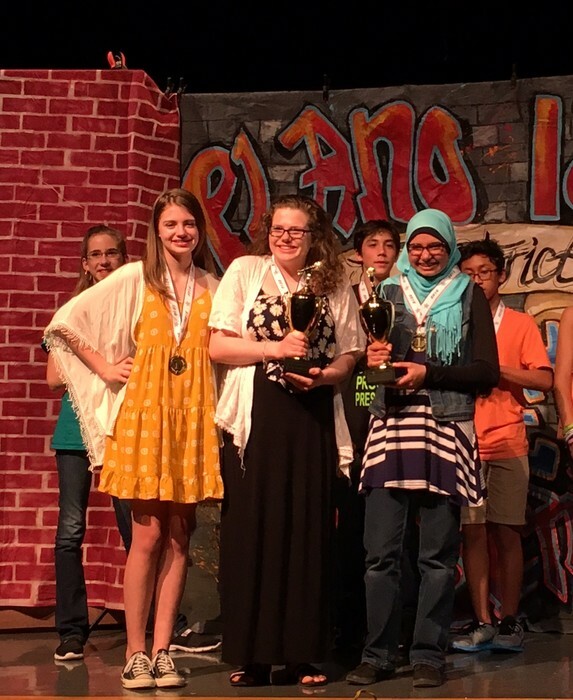 The 1 and 2 place winners from our school slam competed against the winners of six other middle schools across Plano ISD in two categories: single voice poetry and two-voice poetry. All of the participants showed an amazing amount of courage by getting up and sharing their thoughts and ideas in such a public way. In the end, Murphy came away with 1 place in both categories!! We also took home the “Stanley Cups of the Poetry Slam” to be housed in our building until next year. Congratulations to all of the contestants and to Penny Pearson and the other librarians for all of their hard work that made this exceptional event possible. On Monday, May 23 at 6:00PM, Murphy MS AVID will celebrate all the work that our AVID students have been doing throughout the year. We will honor our current AVID students, as well as welcome the new AVID students for next year. Refreshments will be served. Ask your AVID student about the invitation. RSVP at http://tinyurl.com/avidmay2016. Results from March's PACE Testing have been mailed. You should have received the results between May 6-10 in a letter from the district explaining the results, and whether the campus placement committee recommended placement starting in the 2016-2017 school year. 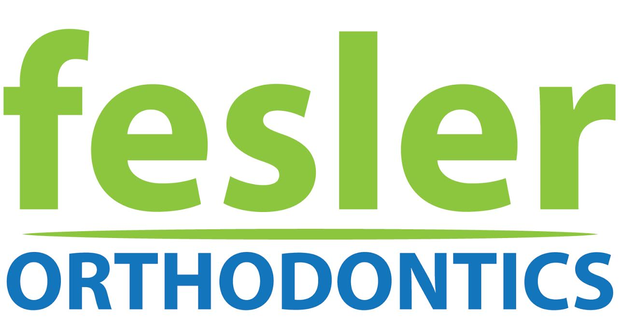 Students that have been recommended for placement will find a permission form/media release that accompanies the results. Please sign and return the permission form/media release no later than Monday, May 23rd. Forms may be dropped off in the front office or brought to Mr. Matisoff's classroom (N101) by your child. Students will not be placed in PACE without a returned permission form/media release. 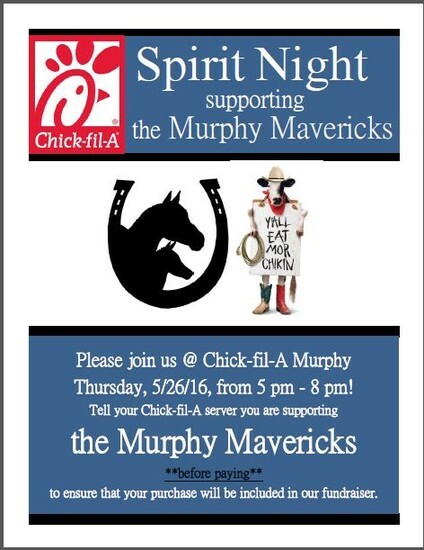 If you have any questions, contact Mr. Matisoff, Murphy's PACE Specialist, whose email is linked below! If you or your student would like to be part of the NJHS text group, please join at Remind. 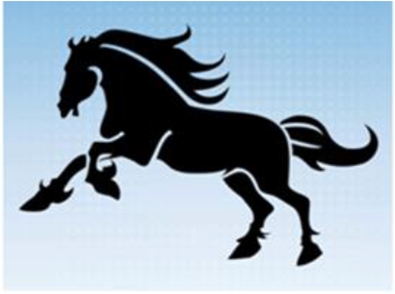 To receive messages about NJHS via text, text @bg4gb to 81010. You can opt out of messages at anytime by replying "unsubscribe @bg4bg"
Trouble using 81010 --- try texting @bg4bg to (972)810-7209 instead. Thank you, Mrs. Mullen and Mrs. Edenkrans. 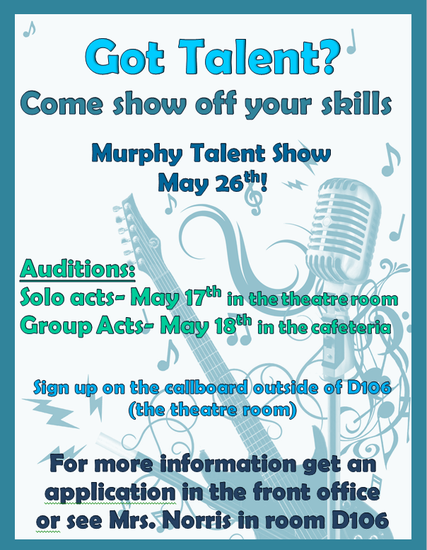 Don't forget to audition for the MMS Talent Show! Talent show auditions are next week! Auditions are on May 17th and 18th. Come by the theatre room to pick up a parent packet. The packets are due on Monday, May 16th. Hope to see everyone there! 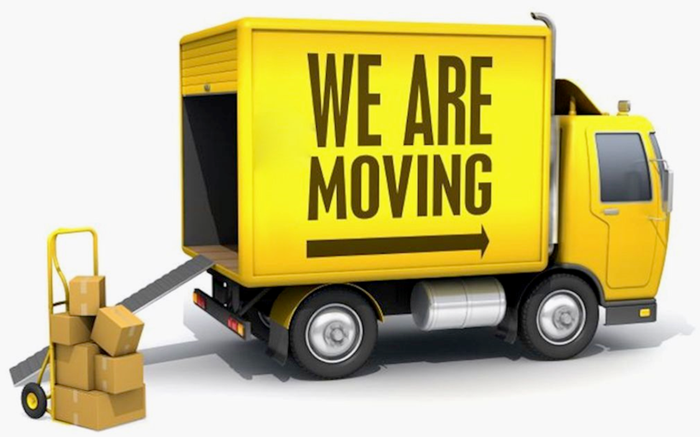 If you know you will be moving or withdrawing your student from Murphy or McMillen (current 8th grader) at the end of school during the summer, please fill out an, "Intent to Withdraw" form as soon as possible. Contact Mrs. Reeves (linda.reeves@pisd.edu) in the Counselor's office for a copy of this form. Please remember - if you later decide to stay in the Murphy zone, you always have a spot! 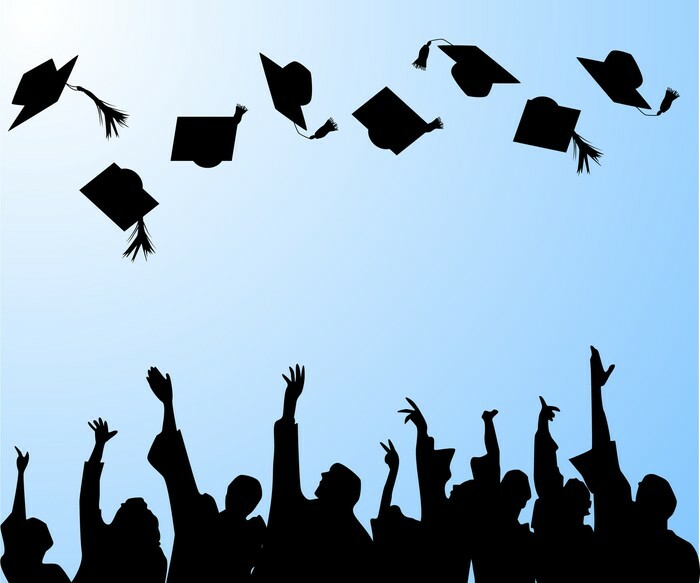 Do you have a student who will be entering 7th, 8th, or 9th grades next year? Are they interested in becoming a part of the award-winning Eastside Golf Team? 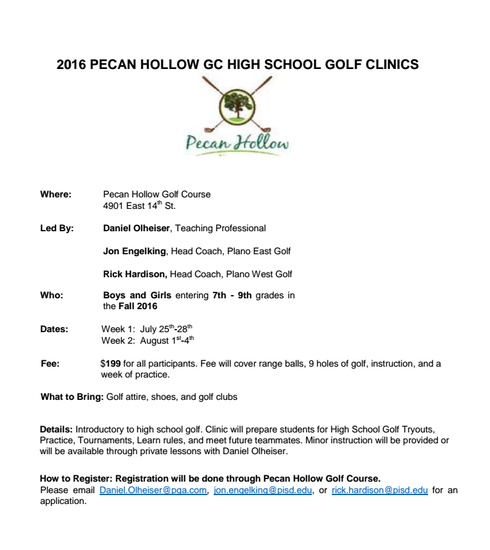 This summer golf camp, run by the Plano East Golf coaches, will give your students the opportunity to learn about golf and meet other potential teammates! Never golfed before? Don't worry! The camp is offering introductory through high school level golf! To request an application, click directly on any of the following email addresses! To view the registration flier, please follow the link below! To see the High School Clinic Application, please click the link below!! Physical forms can be found on the school web-site under the athletic section. Any student wanting to try out for a team must have a physical on file. Physical forms are good for 2 years. Students can turn their physicals into Coach Ragsdale as soon as they get them filled out by a doctor. The physical must be turned in on the UIL form. If you have any questions please contact Coach Ragsdale. On May 14, we will be performing ImPact testing on participating athletes in the East cluster at Plano East Senior High School. The ImPACT (Immediate Post-Concussion Assessment and Cognitive Testing) was created as a screening tool to assist sports medicine professionals in evaluating athletes after a suspected concussion. It is a valuable tool for helping doctors and athletic trainers safely return athletes to the playing field. The Ben Hogan Concussion Clinic will be assisting us in facilitating these tests for a small price of $2. 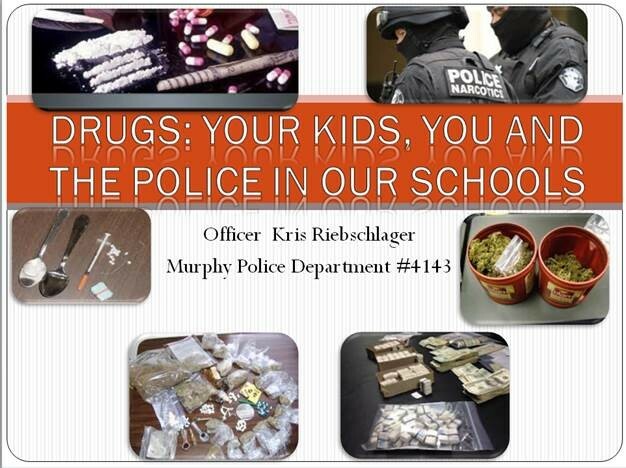 SAVE THE DATE: Saturday, May 21, 2016 at 9 a.m.
You are invited to attend a "Drugs: Your Kids, You, and the Police in Our Schools" program presented by Officer Riebschlager in the McMillen HS Cafeteria. Times have changed, and so have the drugs in our community. 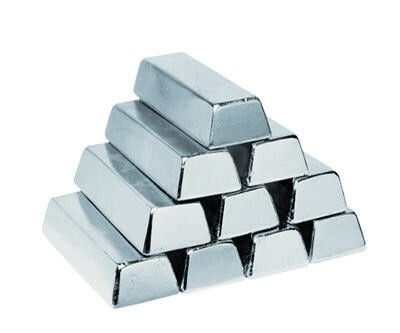 If you haven't attended an Officer Kris program previously, please be advised that he always provides amazing new information that is sure to surprise you. Want a tough, but fun workout with Plano East Girl’s coaches and Athletic Director Joey McCullough? Join the PESH Girl's Soccer Team this summer!! To view the pamphlet and application, click here! 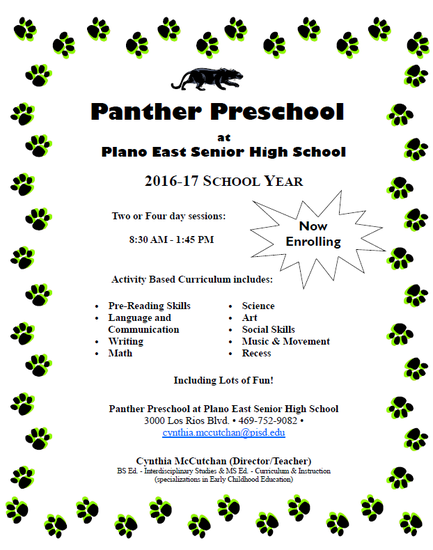 Now Enrolling for the 2016-17 School Year! Designed so that each preschool child may develop to their fullest potential at their own pace. Emphasis on the growth & development of the whole child: physical, emotional, social, and intellectual areas. Activity-based curriculum includes phonics, language & literacy, math, science, art, music & movement, physical (indoor & outdoor), social skills development, and lots of fun. Come join us for an enthusiastic, educational year of exploration! There is a little something for everyone this summer at Collin College. Middle and high school students interested in nursing, robotics, music or dance have a lot of options on campus as summer camps heat up. 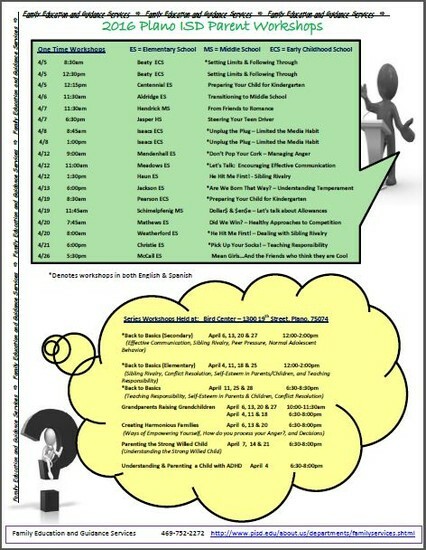 Here is the schedule of the camps sponsored by Collin College. Students will learn test-taking strategies for the SAT. Sample problems and practice tests are included. Open to students 14 years and up. Cost is $69. 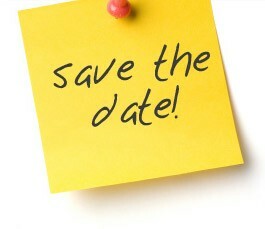 For dates, times, locations and how to register, visit http://bit.ly/1PDnzVx . Students will learn effective test-taking strategies for the verbal portion of the re-designed SAT exam including sentence completions, critical reading, essay writing and improving sentences and paragraphs. Identifying sentence errors will be emphasized. Open to students 14 years and up. Cost is $99. For dates, times, locations and how to register, visit http://bit.ly/1PDnzVx . For students interested in getting an inside look at the nursing profession, Collin College is hosting its free Nurse Camp. Open to students between 8th -12th grades, participants will observe demonstrations and participate in simulations. Space is limited. Registration open through April 29 or until spots are filled. For dates, times, locations and how to register, visit http://bit.ly/1PDnzVx . Students will learn how to turn their idea(s) into a business, determine if they can make money with their idea, learn to price their product or service for their target market and plan social media and other marketing options to get the word out. Students will also enjoy guest speakers, breakout sessions and networking opportunities. Open to teens ages 14 and up. Cost is $149. For dates, times, locations and how to register, visit http://bit.ly/1PDnzVx . Searching, selecting and securing the college that is the best fit can seem overwhelming and a difficult process to navigate. This course will provide students with an action plan, resources and the confidence to succeed not only in getting admitted to their top choice college or university, but also in college life, inside and outside of the classroom. Open to ages 14 and up. Cost is $99. For dates, times, locations and how to register, visit http://bit.ly/1PDnzVx . Students between 7th – 10th grades will stimulate their minds and unleash creativity at the Summer Robotics Camp. Cost is $89 and includes three lunches. This camp is sponsored by the Collin College Robotics Club and the Engineering Department. Spots are limited and registration fills quickly. Early registration is recommended. For dates, times, locations and how to register, visit http://bit.ly/1PDnzVx . The sixth annual Collin Summer Dance Festival features workshops in modern, ballet, jazz, Pilates, musical theatre and hip-hop. Cost is $125. The Summer Dance Festival is for beginners or advanced dancers, 14 years old and up. Space is limited. For dates, times, locations and how to register, visit http://bit.ly/1PDnzVx . Girls between 7th – 10th grades get to design and build their own technological creation at the All Girls Summer Robotics Camp. Cost is $89 and includes three lunches. This camp is sponsored by the Collin College Robotics Club and the Engineering Department. Spots are limited and registration fills quickly. Early registration is recommended. For dates, times, locations and how to register, visit http://bit.ly/1PDnzVx . The Texas All-Star Jazz Camp features a flurry of daily workshops and rehearsals as musicians learn the world of big band jazz. Camp faculty includes top jazz musicians from around the country who have played with big names such as Maynard Ferguson, Doc Severinsen, the Metroplexity Big Band and Woody Herman. This year’s special guest is NYC jazz and rock trombonist Tom "Bones" Malone. Students must be at least 13 years old with at least one year of study on their instrument. Cost is $265 or $310 with lunch. Registration open through July 17 or until spots are filled. For dates, times, locations and how to register, visit http://bit.ly/1PDnzVx . Course offerings vary by site. 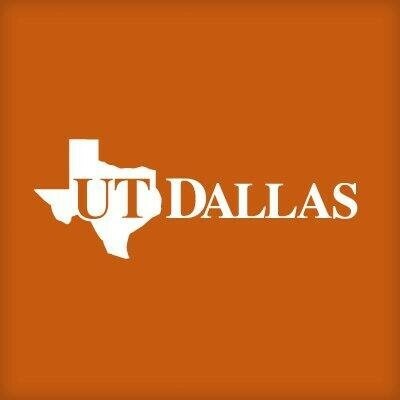 Check UTD site for courses! Is Your Child Interested in Robotics? 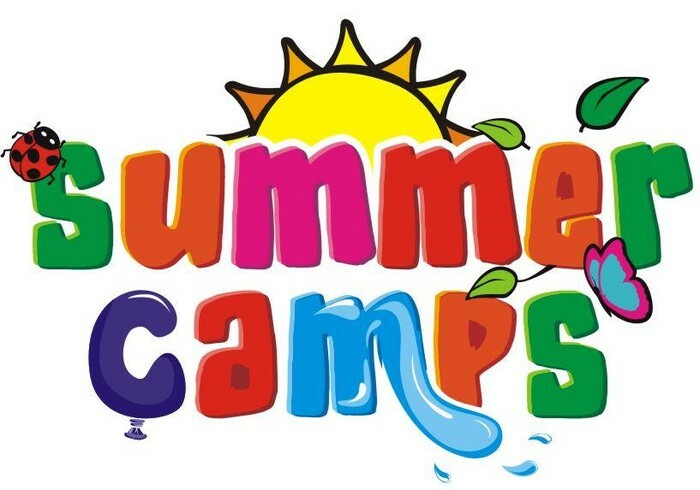 Gateway Academy Summer Camp registration is open! We are offering three camp sessions this summer at Robinson MS, Wilson MS and Otto MS.
Each session is four days long (Mon. – Thurs.) Students can only attend one session. Camp program time is from 7:45 am–11:45 am. Each session is limited to 25 students. It is intended for incoming 7th and 8th grade students only. Camp locations are Robinson, Otto and Wilson. 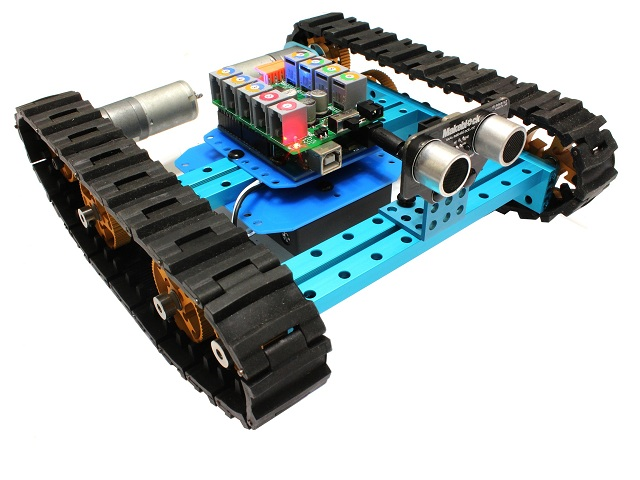 The main projects will revolve around robotics. T-Shirts will be provided for all participants. Each camper will be given a Certificate of Completion on the last day. Campers will take home the projects they complete during the camp (if applicable). The last hour of each session will be a student showcase/show and tell for parents to come in and see what the campers did during the week. Search and favorite all the schools your family attends and see school menus for 30 days at a time! If you want, mark your favorite meals with a star and see when they're coming up again. 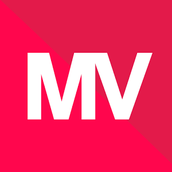 Search for "MealViewer To Go" in the App store, or visit http://schools.mealviewer.com/ today! 8th Grade Celebration - It's time to celebrate our awesome 8th grade class as they prepare to move on to High School! 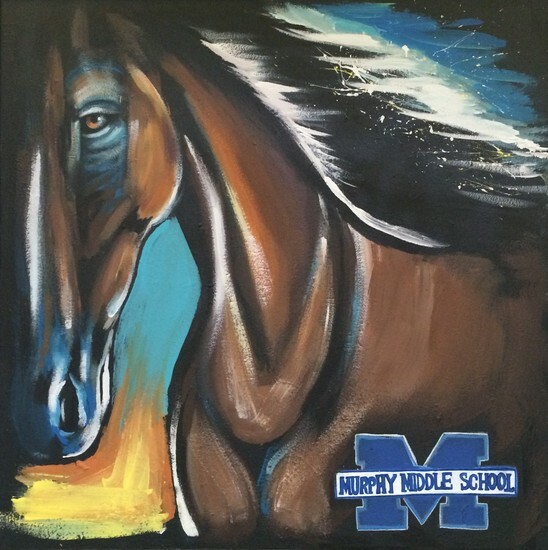 From 12-3 pm on Thursday, May 26th, our 8th graders will get to head over to Murphy PSA for food, fun & to celebrate their time here at Murphy. 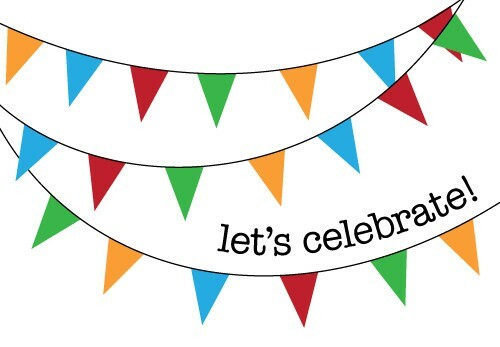 We would love to have a lot of volunteers come help the celebration be a fun & safe place for the students. 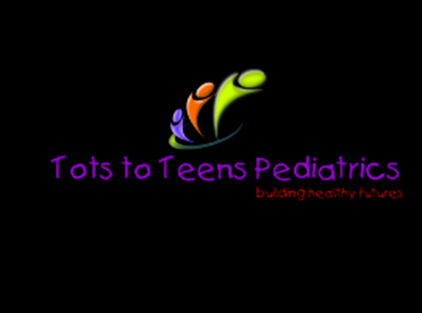 If you are able to volunteer, please sign up at http://mmspta.org/. All volunteers must have a cleared PISD background check for the current school year (2015-16). 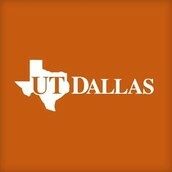 This can be done at: http://www.pisd.edu/about.us/partners.volunteers/volunteer.application.shtml. 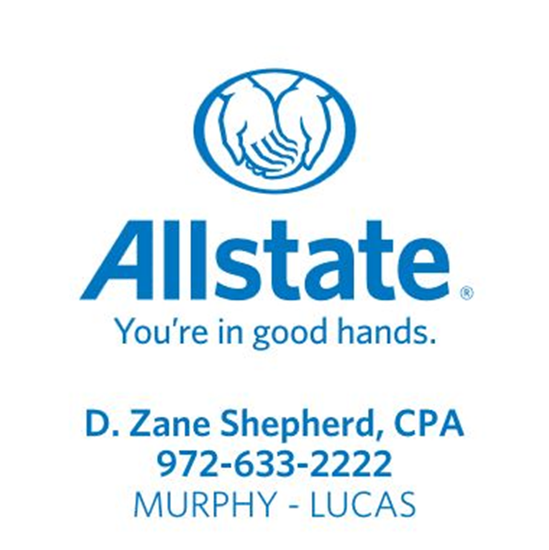 In addition, all volunteers must have checked their ID in at the Murphy Middle School front office sometime this year. All cleared volunteers who have signed up online to volunteer for the 8th grade celebration, have an approved PISD background check, AND have scanned their ID in at MMS sometime this year will be able to go straight to Murphy PSA at their scheduled shift time on May 26th. Everyone else will have to check in at Murphy Middle School first then can proceed to Murphy PSA. 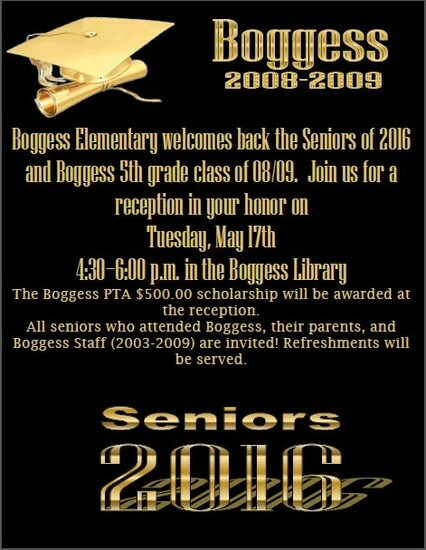 So save yourself a trip, volunteer for the 8th grade celebration & come straight to Murphy PSA. Hope to see you there. Sign up soon...spots are filling up. 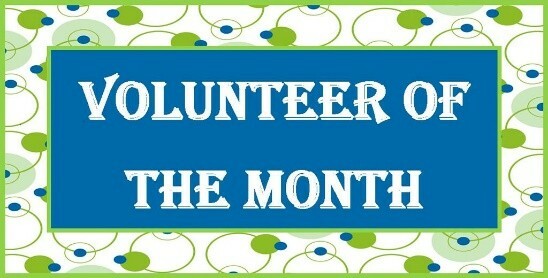 Congratulations to Sara Furtick and Danette Rogers for being volunteers of the month!! Thank you for all you do! 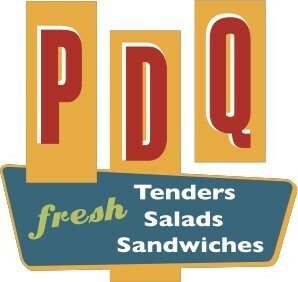 Join us for a Spirit Night at PDQ on Wed, May 18th! 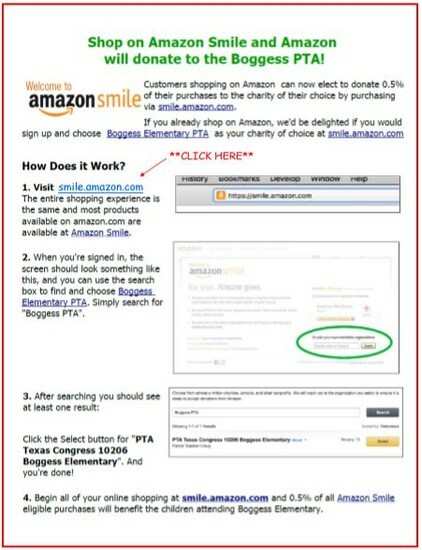 Your Amazon Purchases can help raise money for Murphy! Thank you for contributing to MMS PTA! 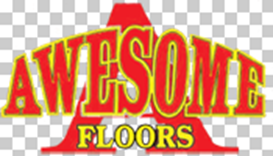 Please remember our generous sponsors when shopping for services or supplies!! If you are getting eNews because you use Parent Portal, please go to: https://parentviewer.pisd.edu/ to revise your subscription.